Oklahoma weather can be unpredictable and turn dangerous very quickly. Trilink Restoration will be here when storms damage your home or business. Here are some safety tips for your whole family to be aware of. Seeking shelter is the most important thing. Usually, this will be in a basement or lowest level of the home or building. Stay away from windows. Try to put as many walls in between you and outside as possible. Have a designated room or area of your home as your “storm shelter.” If you do not have a basement or storm shelter, consider a closet or hallway that puts as many walls as possible between you and the storm. A mattress or blankets can be used to cover your head from any falling debris. Have supplies prepared. If you find yourself in a severe storm situation, you will want to have items like these ready to go. Dark skies, increasing winds, and lightning are strong indicators that bad weather is approaching. Pay attention to these warning signs, because you may only have a short amount of time to seek shelter. Check your local radio, TV, or a trusted weather app on your smartphone for updated information about any approaching storms. Getting inside should be your first priority. Check for weather updates and go to your storm shelter area. 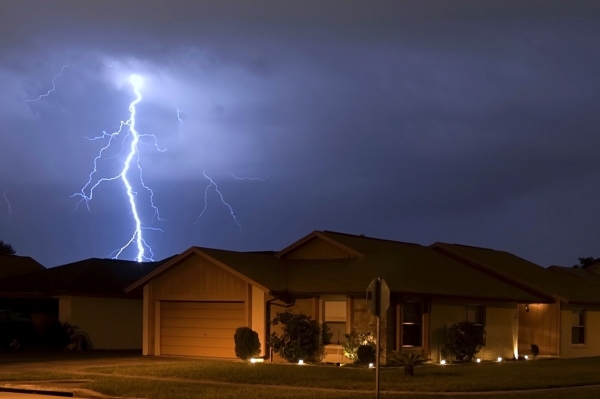 Be careful of water or metal as they conduct electricity and could be harmful during a storm. The same is true for computers and telephones. You can check local TV or radio, or a weather app on your smartphone to check for the all clear when the storm has passed.